A Visio file for the master process file that will be used to navigate to the different processes. 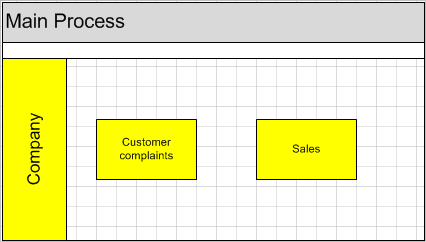 A Visio file for the process Customer Complaints, this process will contain two steps. A PDF-file that will contain information about each step. Two pages that will show the Visio-files. But anyway, this is how I did. First of all I have these settings for Adobe Reader. A main process is created in Visio with links to the pages that holds a Visio web part for each process like Sales and Customer complaints and so on. On the start page for http://server/site/start.apsx a Visio web part will be showing this Main process. I also added a Go back button above this web part so that they in an easy manner could go back to the page that holds the Main process. First I made sure that the information about each process step started on a new page in the document. Then I saved the Word-file as a PDF letting Word create bookmarks in the PDF-file from the headings in the document while it was beeing published. That way we get a table of contents in the left navigation of the PDF. The Customer complaints visio-file (that is saved as a .vdw-file) holds two different steps ACC CC and Qualify CC. Description is set to ACC CC and I don’t use a relative path. Ok, so this is something that I don’t like with the new vdw-type of file, you can not set a link for an object to open in a new window. This code you could simply copy and paste and put in a CEWP or FormWP on the page where you have your Visio web part, to try it out. // and the shapes on the active page. // Add a handler to the AJAX Sys.Application.load event. // Capture a reference to the current instance of the Visio Web Access Web Part. // Add a handler to the 'diagramcomplete' event. // Set the vwaPage and vwaShapes variables to the active page and the shapes collection on that page, respectively. // Remove the handler from the shape selection changed event and then add it back to the event. // Set the active page in the drawing to the page ID passed in as argument. // Check to see if the hyperlink goes to another page in the drawing. // Open the hyperlink in a new window. //Set the active page to the new page. Now when you click on a process step, the actual page in the PDF-file should be brought up in a separate window and give you the instructions about that step. You should also have a table of contents in the left pane in AcrobatReader so that you could easily navigate between different instructions. Well thats about it guys, I hope this will help you or give you some ideas. Great stuff Nickas, a keeper. Thx for sharing! I have put add above script in content editor but i think script is not fired. When I saw your comment I did a test in my dev environment and it worked perfectly well. What happens when you click on a shape? When I went through the post I saw that I forgot to mention that you should put a checkmark at “Disable hyperlink” in the Visio web part, I will add that to the post. Let me know how things turns out. Thanks Niax and appreciated your prompt response.After setting disable hyperlink property it works fine.